I needed to be in New York for work on Monday morning, so I went up Friday afternoon and took Shelley along for the weekend. She had not been for there for 12 years, and I rarely had time for site seeing on my other trips, so it worked out perfectly. 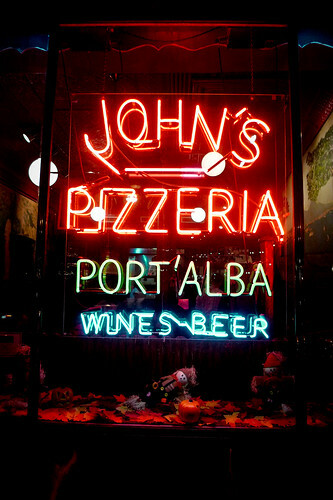 My friend Fraser arranged a dinner for us at John's Pizzeria, since the pizza you fold is on the list of foods tourists must eat when in New York. Good choice by Fraser, since the pizza was excellent and folded very nicely.